These can be obtained from Council’s Offices at Laurieton, Port Macquarie and Wauchope or by downloading it from Council’s website. Your request to address Council must be received by Council no later than 4:30pm on the day prior to the Council Meeting. · Council will permit no more than two (2) speakers ‘in support of’ and two (2) speakers ‘in opposition to’ the recommendation on any one (1) Agenda Item. · A maximum of five (5) speakers will be heard in the Public Forum. · There is no automatic right under legislation for the public to participate in a Meeting of Council or a Committee of Council. · For a member of the public to be considered to address Council they must agree to strictly adhere to all relevant adopted Council Codes, Policies and Procedures at all times. · Consideration of items for which requests to address the Council Meeting have been received will commence at 5:30pm. · When your name is called, please proceed to the Council Table and address Council. · Each speaker will be allocated a maximum of five (5) minutes to address Council. This time is strictly enforced. · Councillors may ask questions of a speaker following an address. Each answer, by the speaker to a question, is limited to two (2) minutes. A speaker cannot ask questions of Council. · An Agenda Item will be debated by Council following the address. · Council will not determine any matter raised in the Public Forum session, however Council may resolve to call for a future report. · If you have any documentation to support your presentation, provide two (2) copies to Council by 12 noon on the day of the Meeting. · If a speaker has an audio visual presentation, a copy of the presentation is to be provided to Council by 12 noon on the day of the Meeting. - Proposed or current development and rezoning applications and related matters. - A third (3rd) or subsequent application by a single member of the public to address Council on the same issue in the same calendar year. Council, at its discretion, may elect to exempt representatives or members of community groups from this restriction. - Any formal procurement process, contract negotiation or dispute resolution being undertaken. - Any matter the General Manager (or their delegate) considers inappropriate for discussion in the Public Forum. · Council accepts no responsibility for any defamatory statements made by speakers. · Members of the public may quietly enter and leave the Meeting at any time. 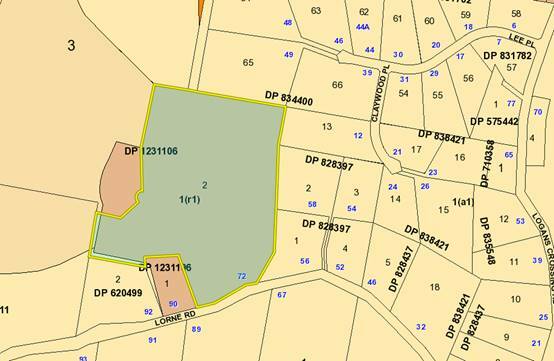 That Section 4.55 modification to DA 2010 - 577 for a modification to subdivision layout including addition of one (1) torrens title lot at Lot 2, DP 1231106, No. 72 Lorne Road, Kendall, be determined by granting the modified consent subject to the recommended conditions. This report considers a Section 4.55(2) modification of consent application at the subject site and provides an assessment of the application in accordance with the Environmental Planning and Assessment Act 1979. Being a Section 4.55 modification, the modified proposal has only been assessed against the legislation and related planning guidelines in place at the time of the original assessment. The proposal has been amended during the assessment of the application. The Panel was unable to reach a consensus. a) The proprietor of the property shall be responsible for maintaining and keeping clear the overland flowpath. b) The Council shall have the right to enter upon the land referred to above, at all reasonable times to inspect, construct, install, clean, repair and maintain in good working order all components or structures in or upon the said land which comprise the overland flowpath; and recover the costs of any such works from the proprietor. c) The registered proprietor shall indemnify the Council and any adjoining land owners against damage to their land arising from the failure of any component of the overland flowpath, or failure to clean, maintain and repair the overland flowpath. 1. Concerned that a significant part of the site is shown within the major flood storage area and the site contains an overland flow path, which is to be re-aligned with a profile of depth up to a metre and width of six metres and receive a discharge from 2 x 600mm diameter pipes, resulting in a likely unsafe velocity in the channel (ie V x D ratio exceeding 0.4m²/second). 2. The proposal does not overlay properly the various easements to demonstrate that a suitable dwelling and ancillary buildings can be safely erected. To assist Council with the determination, additional comments have been provided in the Stormwater and Flooding section of this report to address the concerns of Mr Hussey. The site has an area of 13.11 hectares. The development is physically commenced with Lots 1 and 2 already created/released. · Modify previous approved staged subdivision to realign boundaries and add an additional one (1) allotment at the northern end of the subdivision (where Lot 9 and 10 are shown above). This will increase the total lot numbers from 13 to 14. The proposal has been also amended during the assessment of the application to incorporate compliant cul-de-sac sections of road with a 12m radius. 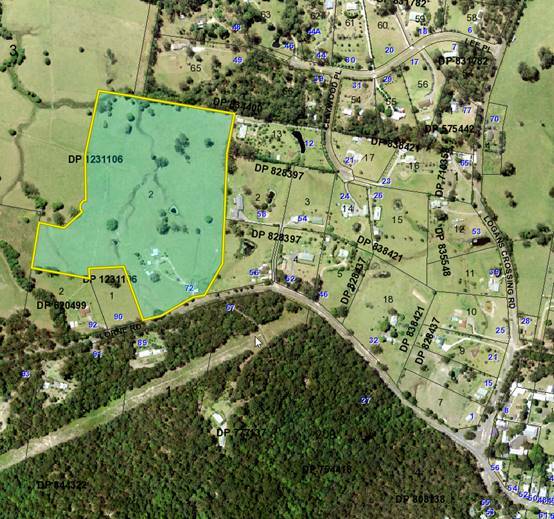 This has also resulted in minor changes to boundaries to retain compliant minimum 1 hectare lot sizes. · 26 April 2018 – Consideration of DA by the Development Assessment Panel. Resolution to defer consideration of DA until further information is received on stormwater. Revised information since received. · 9 May 2018 – Further consideration of DA by the Development Assessment Panel. (a) Is the proposal substantially the same? Section 4.55 of the Environmental Planning and Assessment Act 1979 enables the modification of consents and categorises modifications into three categories - S.4.55(1) for modifications involving minor error, mis-description or miscalculation; S.4.55(1A) for modifications involving minimal environmental impact; and S.4.55(2) for other modifications. Each type of modification must be considered as being substantially the same to that which was originally consented to. The subject application is being considered under the provisions of Section 4.55(2). · The proposal seeks to modify minor aspects of the approved subdivision but does not alter the servicing capacity, the environmental principles nor the character of the approved development. · One additional x 1 ha allotment will result in the northern location and it does alter the intersection location or road access principles. · The modified proposal conforms to the requirements of existing Rural Fire Service S100B authority. Having regard to the above, the proposed modification is not considered to alter the fundamental essence of the original development and is considered to be substantially the same to the original development and therefore within the scope of a modification application. (b) Are there any condition(s) of consent imposed by a Minister, government or public authority that require modification? The application has been referred to the NSW Rural Fire Service (RFS). The RFS have reviewed the proposal and issued an amended Bushfire Safety Authority for the modified proposal. The Applicant has also submitted amended plans to provide details of the required minimum 12m radius cul-de-sacs required by the RFS. (c) Does the application require notification/advertising in accordance with the regulations and/or any Development Control Plan? Neighbour notification has been undertaken in accordance with the DCP. (d) Any submissions made concerning the modification? One (1) written submission has been received following public exhibition via neighbour notification of the application. The issues raised in the submission received have been forwarded to the Applicant during the assessment of the application. Concerns relate to the onsite sewage management of this modification referring specifically to the three blocks 9, 10 and 11 having common boundary with our property Lot 65. The Applicant has submitted additional specialist information during the assessment of the application to address site specific on-site sewage management for the proposed additional lot and boundary reconfiguration. A copy of this report is attached. The additional report submitted has been assessed by Council Staff as being satisfactory. The latest proposed modification of the subject site could significantly increase environmental effects such as potential for seepage/runoff to our creek immediately adjacent to our South boundary, any contemplation that another method of disposal of septic waste, secondary or not, within the 40 metre zone would mean leakage into our creek. Concerns of how overland stormwater runoff will be channelled away from this development considering the slope characteristics of the site and in particular regard to the proposed roads 1 and 2. Refer to the comments provided later in this report to address stormwater. (3) Any matters referred to in section 4.15/79C (1) relevant to the modification? In accordance with clause 2, the modified proposal remains consistent with the aims of this REP. In accordance with clause 12, the modified proposal is unlikely to adversely impact on the use of any nearby adjoining or adjacent agricultural land and the proposed subdivision will be unlikely to result in a significant loss of prime crop or pasture land. In particular, given the section of the site had a previous zoning change (that has occurred) to become 1(r1) now known as R5 Large Lot residential. The above LEP was in place at the original time of assessment and determination of this DA. In accordance with clause 9, the subject site (in total) is zoned part 1(a1) Rural, 1(a3) Rural – Agricultural Protection, 1(r1) Rural Residential and 7(h) Environment Protection - Habitat. The modification to the remaining subdivision lots to be constructed and released are entirely within the 1(r1) zoned section of the site. (a) To enable the development of land within this zone for rural residential purposes. (b) To enable appropriate development where allowed with consent. The proposal is consistent with the zone objectives, particularly as the proposal will not result in any unnecessary land fragmentation and based upon appropriate conditions recommending fencing off the 7(h) zoned land. In accordance with clause 13, satisfactory arrangements are available for water supply and facilities for removal/disposal of on-site sewage and drainage to the proposal (as amended). Note that Stage 1 will not require/propose extension of water supply servicing to proposed Lot 2 within Stage 1. In accordance with clause 17, the Lot sizes proposed within the 1(r1) zoned part of the site remain compliant with the minimum 1 hectare land area requirement, will provide for satisfactory land area to enable on-site disposal of effluent and bushfire risk has been satisfactorily addressed. The requirements of this LEP are therefore satisfied. The modified proposal remains to comply with all applicable development provisions relating to recommended lot servicing and design requirements of this DCP. The modified proposal will be unlikely to have any adverse impacts to existing adjoining properties and satisfactorily addresses the public domain. The desired character for the site has been set by the change in zoning to rural residential and with the 1 hectare lot size adopted. The modified proposal is considered to be consistent with the desired character for future and existing rural and rural residential development in the locality and adequately addresses planning controls for the area. There are no identifiable adverse impacts to neighbouring properties. 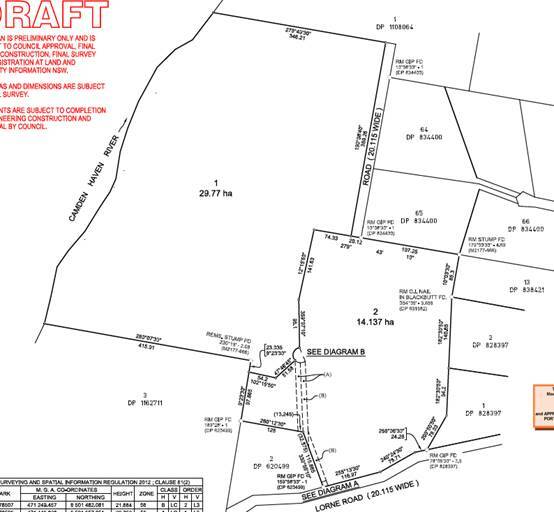 The subject property has frontage to Lorne Rd which is a dedicated bitumen sealed rural road maintained by Council. Lorne Rd carriageway is approximately six (6) metres wide. The proposed subdivision has already been approved to produce 91 additional daily trips, the addition of one extra allotment will not have any significant effect on the proposed development or the surrounding road network. The Applicant has submitted additional specialist information during the assessment of the application to address site specific on-site sewage management for the proposed additional lot and boundary reconfiguration. A copy of this report is attached. The additional report submitted has been assessed as being satisfactory. The proposal does not include a stormwater management plan and instead notes that the subdivision will be constructed in accordance with the plan prepared as part of the rezoning of the site. The original assessment raised no objections towards this approach in principal noting that detailed design and remodelling of all elements will be required to be undertaken prior to the issue of a Construction Certificate. There is a Stormwater Management Plan dated March 2007, which includes the use of infiltration trenched/basins and buffer strips on private property, appropriate easements and positive covenants/restrictions as to user will be required to be placed on relevant lots at time of subdivision and maintenance access/rights are provided. Such instruments will also be required to be created over flowpaths through the properties to both enable future access and to alert purchasers/landowners to their rights and obligations with respect to the flow of waters through the site. There is a condition already imposed to create a positive covenant for maintenance of the existing overland flowpath over the site. Stormwater analysis has been submitted demonstrating that the pre development flows within the existing watercourse are 5.81 cu.m/s with a water level of 11.37m AHD adjacent to Proposed lot 7. The post development flow will be 5.83 cu.m/s within the realigned overland flowpath with the water level maintained at 11.37m adjacent to Lot 7. The depth of flow within this flowpath is to remain at 370mm as per pre development. In addition to the above stormwater management, changes in the potential flooding levels associated with the Camden Haven River have occurred since the original development application (DA2010 – 577) was determined. 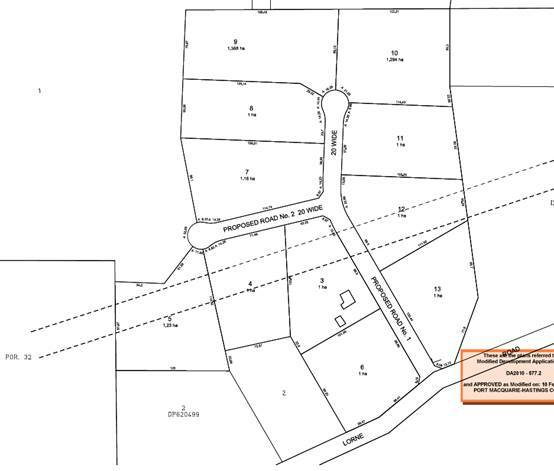 This has resulted in some impact on the proposed modified subdivision layout including the additional lot proposed. In particular, the Camden Haven Flood Policy was adopted by Council in 2015 (after the original DA2010 – 577 approval was issued). The Camden Haven Flood Policy included a reference to the Camden Haven Floodplain Risk Management Study 2013. The 2013 Study has identified a change in the flooding levels for the subject area. For example, the identified 1 in 100 year flood risk level including allowance for climate change is RL13.25m AHD with a standard requirement to require a 500mm freeboard above that level to a minimum RL13.75m AHD. These floor levels would apply to the construction of any future dwelling. In this regard, it is recommended that the condition E(2) be modified to include a restriction on Lot 7 to require an achievable minimum habitable floor level of RL13.75m AHD. Overall, the above change to the condition, along with the recommendation from Mr Drake and Mr Tink, addresses the capability of the modified lot within the subdivision to meet current standards. This would then enable any new dwelling on the proposed Lot 7 without creating any impact on stormwater/flooding and visa versa. The proposed building platforms on proposed Lots 8 & 9 are well in excess of any required freeboard and do not create any issue. Water Supply for this modified development can remain to be provided from the 100mm AC water main on the same side of Lorne Road. Fire service coverage to the building envelope of each lot to AS 2419 is to be provided wherever there is reasonable prospect of coverage from a street hydrant. The subdivision plans with suitable Section 88B instruments are to show building envelopes that can be covered by street hydrants to AS 2419. This information is to be shown on the engineering plans for assessment by Water Supply Section before linen release but is deemed capable of complying. The site is identified as being bushfire prone. The Applicant has submitted a revised bushfire report, which was forwarded to the NSW Rural Fire Service. The NSW Rural Fire Service have assessed the application and issued an amended Bushfire Safety Authority for the modified development. A copy is attached to this report. The proposal has been also amended during the assessment of the application to incorporate compliant cul-de-sac sections of road with a 12m radius. Section H of the development consent is recommended to be deleted and replaced with a more current standardised condition to reference the amended bushfire authority. · Additional development contributions for the additional lot will be required towards augmentation of local water supply head works under Section 64 of the Local Government Act 1993. · Additional development contributions for the additional lot will be required under Section 94 of the Environmental Planning and Assessment Act 1979 towards roads, open space, community cultural services, emergency services and administration buildings. The application has been assessed in accordance with Section 4.55 of the Environmental Planning and Assessment Act 1979. Issues raised during assessment and public exhibition of the application have been considered in the assessment of the application. The site is suitable for the proposed modified development, is not contrary to the public's interest and will not have a significant adverse social, environmental or economic impact. It is recommended that the application be approved, subject to the recommended conditions of consent provided in the attachment section of this report.